This morning I tweeted, "Managed to dress like an older, seedier version of the Morton Salt Girl today." Response was immediate and positive. I laughed it off but was flattered enough to promise I'd take a photo tonight when I got home. Before I wrangled the self timer into submission I did a little research on the internet. 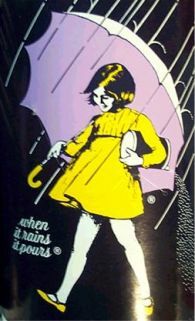 Turns out I didn't look like the Morton Salt Girl at all. I really thought she had boots. That was the only important part to me, the boots. No surprise, really, I do love the shoes most of all, even now that I live in a place and time where comfort has to beat all. You never know when you're going to find yourself walking the 6 miles home. So I don't know who I really wound up dressing like but I took a picture all the same. Could have been worse. It was raining and hot today. I could have gone to work recreating this vintage advertisement instead. Aw, geez. 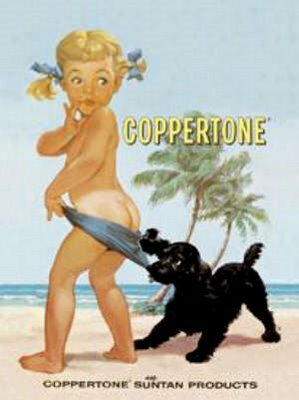 Now you HAVE to do the Coppertone ad. Oh. Now. I really do not think so. Kind of you to say I should, though. Ha! You even have the facial expression. What kind of boots are they? I almost splurged on a pair yesterday but they lacked the comfort level necessary for their price. I don't know what brand but they were from the store were are not supposed to shop at anymore (Tarjay). A kindly blogger from a place where the wind comes sweeping down the plains sent them to me. I think I need to get some insoles to keep them on properly but I love them. 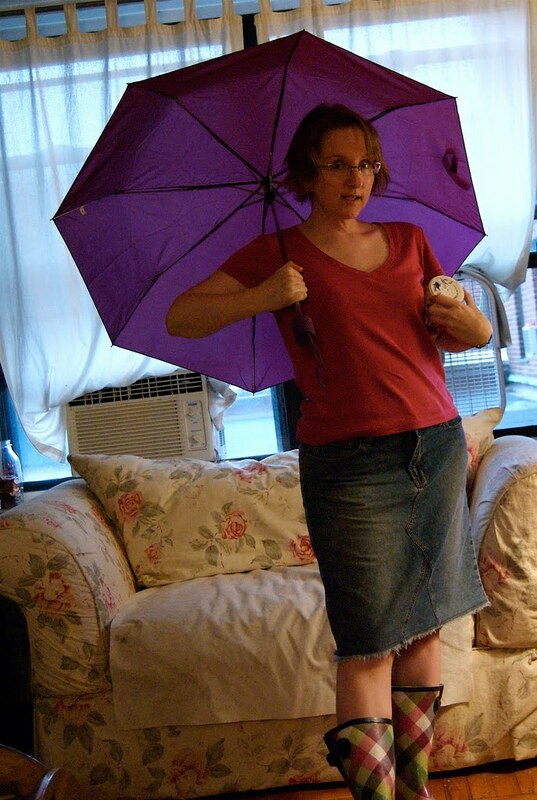 That's my new Ebay'd skirt, too.